The meeting also vowed to strengthen the Party's confidence in the path, theory, system and culture of socialism with Chinese characteristics, according to a statement issued after the meeting. At the meeting, members of the Political Bureau were asked to conduct criticism and self-criticism in light of work experience and how they have taken the lead to implement Xi's instructions and key Party regulations and policies, including the eight-point decision on improving Party and government conduct. 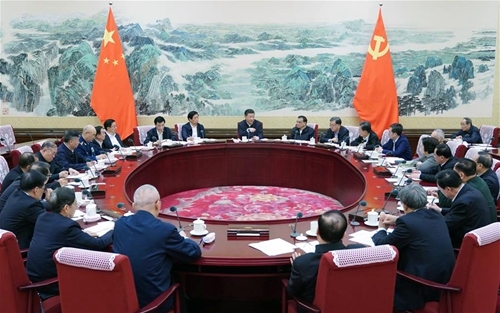 Participants deliberated on a report on the implementation of the eight-point decision by the Political Bureau of the CPC Central Committee since the 19th National Congress of the CPC before the Political Bureau members gave speeches one by one. The Political Bureau members emphasized in their speeches that they would take the lead in studying and implementing the Xi Jinping Thought on Socialism with Chinese Characteristics for a New Era, in carrying out decisions and plans made by the CPC Central Committee and in strictly following the eight-point decision and its detailed rules. They were required to set a good example to the whole Party in studying, understanding and implementing well the Xi Jinping Thought on Socialism with Chinese Characteristics for a New Era. They were also urged to study the latest speeches given by Xi in a timely manner. According to the statement, Xi has shown vision in making strategic decisions, exercised highly adept political leadership and demonstrated clear commitment to the people and a strong sense of responsibility, which proved that he has been "worthy of the core of the CPC Central Committee and the whole Party." The Political Bureau members were ordered to closely follow the CPC Central Committee with Xi at the core in terms of their thinking, political orientation and actions and fight against violations of political discipline and regulations. They were urged to take the lead in thoroughly implementing the decisions of the CPC Central Committee, as well as to discipline themselves, their families and close aides at work. 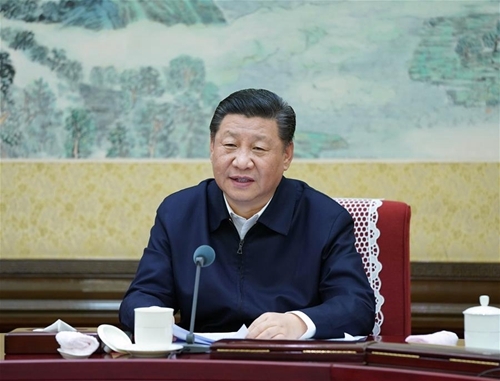 The Political Bureau members should take the lead in implementing the eight-point decision and pay close attention to how local governments and departments under their supervision carry out the rules, Xi said at the meeting. Xi said that "democratic centralism" is the fundamental organizational principle and leadership system of the CPC, calling it an important feature that distinguishes Marxist political parties from other political parties. He said the system integrates full intra-Party democracy and proper centralism, making it a scientific, sound and efficient system. Xi said efforts should be made to unify both democracy and centralism and truly transform the strength of "democratic centralism" into political, organizational, institutional and practical strengths of the Party. Stressing the authority and centralized, unified leadership of the CPC Central Committee, Xi said that many tough problems, which had been long on the agenda but never resolved, were solved, and many things, which had been wanted but never got done, were accomplished because of the unity within the Party. Noting that governing such a large party and country requires intraparty democracy, Xi said that implementing democratic centralism is the common political responsibility of the whole Party and is primarily the responsibility of leading cadres of all levels, especially the Political Bureau members. Party officials, especially the leading Party officials, should maintain their fighting spirit and enhance their competence, Xi said, noting officials should be put on the front lines to hone their abilities.